Unfortunately in lip augmentation injections and lip augmentation surgery not all surgical results go as planned, or meet the patient’s expectations. This can happen for a variety of reasons. The most common reason for revision of lip augmentation is asymmetry of the lips caused by scar tissue formation, infection after surgery, or the patient had an implant that is extruding, shifting or causing granuloma formation (the bodies reaction against the material injected). Revision Lip Augmentation Patient 1: This patient underwent prior lip augmentation with severe asymmetry and unnatural looking lips. Doctor Jacono performed corrective lip enhancement with an incision inside the lips. Note the improvement in lip symmetry. If you have had lip injections with Restylane, Juvederm, or Perlane which are hyaluronic acid fillers no surgery is required and an enzyme called hyaluronidase can be injected to dissolve the material away in 24 to 48 hours. Common lip implant materials include GoreTex, Silicone Injections, AlloDerm, Fat Grafts, and Saline Filled Silicone Implant. 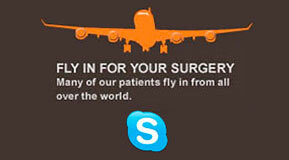 Doctor Jacono is a specialist in revision lip augmentation surgery. Most times he can perform the revision surgery with incisions inside the lips so there are no external scars. Sometimes he needs to graft tissue from your own body to create a natural symmetric contour to the lips. He avoids using any synthetic implants in the lips so that further problems can be avoided. Revision Lip Augmentation After Lip Silicone Injections Patient 2: This patient underwent prior lip augmentation with lip silicone injections resulting in severe asymmetry and unnatural looking lips. Doctor Jacono performed corrective lip enhancement with an incision inside the lips. Note the improvement in lip symmetry. 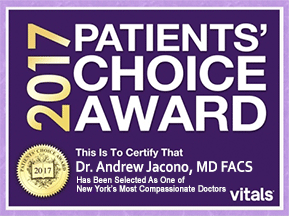 Doctor Jacono is a reconstructive plastic surgeon who has published on lip augmentation procedures in the medical literature and lectured all over the country (click here to see his publications). He also performs reconstructive surgery on patients who need a lip created because it was removed due to cancer. One of the most common reasons for lip enhancement revision lip augmentation is removing lip silicone injections. Silicone lip injections are not FDA approved and while they are permanent there is a risk of lumpiness and granuloma formation years later. The complications of silicone lip injections can sometimes be treated with cortisone injections or in severe cases removal of the nodules. 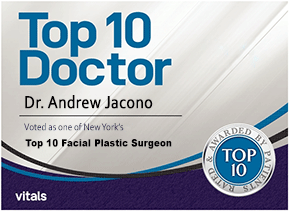 Doctor Jacono has extensive experience in helping patients who have undergone silicone lip injections and require correction. Revision Lip Augmentation After Lip Silicone Injections Patient 3: This patient underwent prior lip augmentation with lip silicone injections resulting in severe asymmetry and unnatural looking lips. Doctor Jacono performed corrective lip enhancement with an incision inside the lips. Note the improvement in lip symmetry.